The fine, powdery material that makes up the lunar surface is most commonly called "regolith" in the scientific and engineering literature, so that tradition will be followed here. The earliest studies had conventional equipment strip mine the moon's surface, e.g., "front loader" vehicles to scoop up the regolith and drop it into "haulers" which would bring it back to the materials processing site. In these scenarios, the vehicles would be launched from Earth and need to be assembled after landing on the lunar surface. The haulers would not be as structurally massive as Earth haulers due to the Moon's one-sixth gravity. However, the loaders would be nearly the same, since they need a counterweight when scooping up regolith. Simple counterweights would be produced from lunar materials, not launched from Earth. Application of terrestrial mining experience and technology to the lunar environment, with emphasis on teleoperated and automated systems, is covered in a U.S. government (public domain) paper presented at the 1993 AIAA/SSI conference by E.R. Podnieks (Senior Staff Scientist) and J.A. 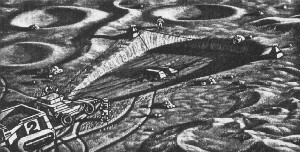 Siekmeier (Civil Engineer, Twin Cities Research Center) of the U.S. Bureau of Mines, entitled Terrestrial Mining Technology Applied to Lunar Mining (paper reference). A significantly improvement may be to replace the front end loaders with a simple bucket-and-reel system, called a "flail" or "slusher", as shown below, as put forward by mining engineer Robert Gertsch (ref. 3). It pulls the dirt up a ramp and into the hauler. NASA artwork by L. Ortiz showing Richard Gertsch's slusher mining system. Since the surface material is powdery, a flail may handle the job of collecting bulk lunar material. The above are methods used on Earth and adapted to the Moon. Other methods have been proposed which have no precedent on Earth, but they may be considered too new and unproven to be considered by a private venture in the near term. For most of the Moon, the top few meters of the lunar surface consists of a mix of minerals, whereas lower depths probably offer more uniform minerology from the old magma oceans. The mix on the surface is due to all the splashes of asteroid impacts which has mixed materials from distances. Also, the surface is glassier due to the superheated nature of the asteroid ejecta and the subsequent quick cooling. Many proposed methods for materials processing call for processing just one particular mineral, e.g., ilmenite. This would require either separating the desired mineral from the regolith mix, or mining underneath the surface where the mineral may be found in a fairly uniform state. Which mining method is used, and which mining site exploited, depends upon which products are desired, the processing methods employed, and the amount of investment that financiers are willing to put forth. The Apollo missions were surprised by the difficulty of extracting subsurface samples. While the top was powdery and soft, attempts to drill into the surface and extract subsurface material resulted in seizing of drill tubes which could not be removed and had to be abandoned. Contact Richard E. Gertsch (see paper references 1, 3), Levent Ozdemir (see paper reference 1), or R. J. Miller (see paper reference 2).